<q> tag is used to define a short quotation. <q> tag supports Global Attributes and Event Attributes. <q> tag belongs to Flow content, phrasing content and palpable content. <q>Ranging</q>from advanced beginners to skill levels. 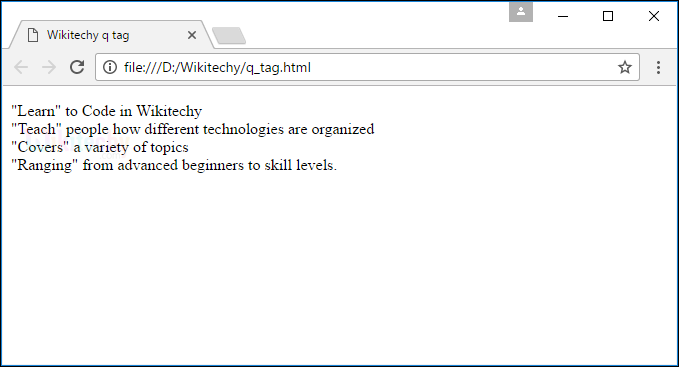 <p> tag is used to display paragraph in the html document. The text inside the <q> tag will be displayed in short quoted text. The words “Learn , Teach , Covers & Ranging” was in short quoted text. cite URL Yes Yes To specify the source URL of the quote. Use <blockquote> to mark up a section that is quoted from another source.